DOZENS of people have been shown how to save thousands of pounds in heating their homes in the Post area. The biggest energy switching campaign held by the Arun and Chichester Citizens Advice saw help given to residents keen to shrink their energy bills. 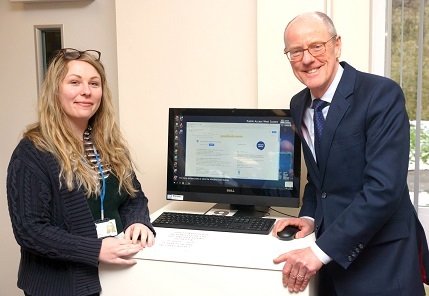 The final day of the initiative last Friday saw Bognor Regis and Littlehampton MP Nick Gibb meet advisors to see the money saving work in action. Mr Gibb said: “This is a wonderful event. It’s clear that everyone who comes along here is able to see money. “There are savings to be made by staying with the same supplier but even more if they switch supplier. The final session of the campaign’s ten days was held in Bognor Regis Library in London Road. The efforts in the Bognor Regis and Chichester area formed part of a national week to encourage households to compare their energy costs. In all, 34 switching conversations took place at the six events to save £4,561 in fuel bills for the individuals who took part. When benefits advice was also given, the total amount gained was £22,000 a year. many of those who went along where in their 80s and 90s and lacked the confidence to switch. They were paying a high price for their loyalty to their energy companies. The campaign saw sessions held in Midhurst, Petworth and East Wittering as well as the main centres of Chichester, Bognor Regis and Littlehampton. This is the first time Citizens Advice has travelled to the outlying towns. As well as the energy bills advice, those who attended also gained from the advisors’ expert knowledge. A 94-year-old man who attended the East Wittering event saved £600 on his electricity bill as well as being made aware he could claim attendance allowance, a parking Blue Badge and regular visits from an occupational therapist. A couple in Petworth were shown how to cut their energy bills by £200 a year but also found out they were eligible for an annual £11,000 in benefits.